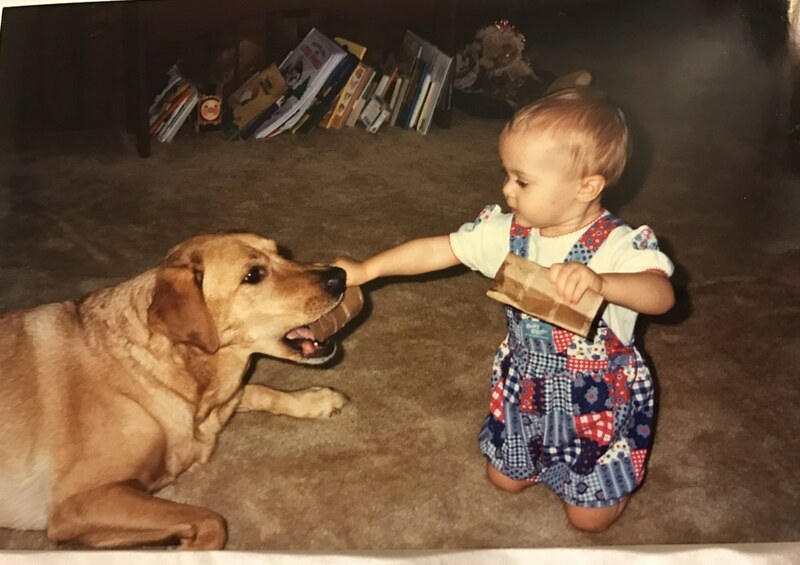 When people talk about their childhood pets, I joke that I was raised be a Labrador Retriever. I joke, but it’s partially true. 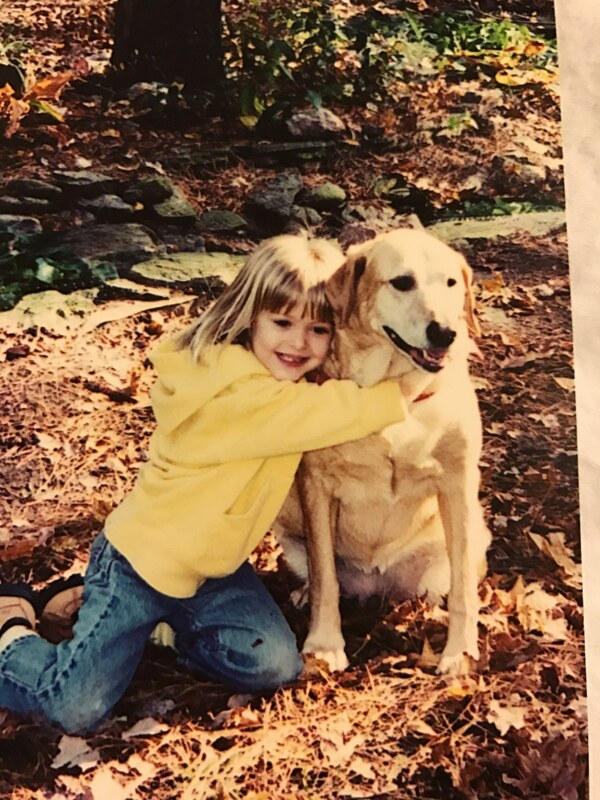 Daisy was a golden furred, brown eyed, four legged angel. She was five when I was born and disrupted all peace at the house. My brother was ten and well mannered. She never had to fear a pulled tail or tugged ears from him. But I was a screaming, toddling terror that attacked anything that moved. Namely her. Daisy didn’t mind, though. 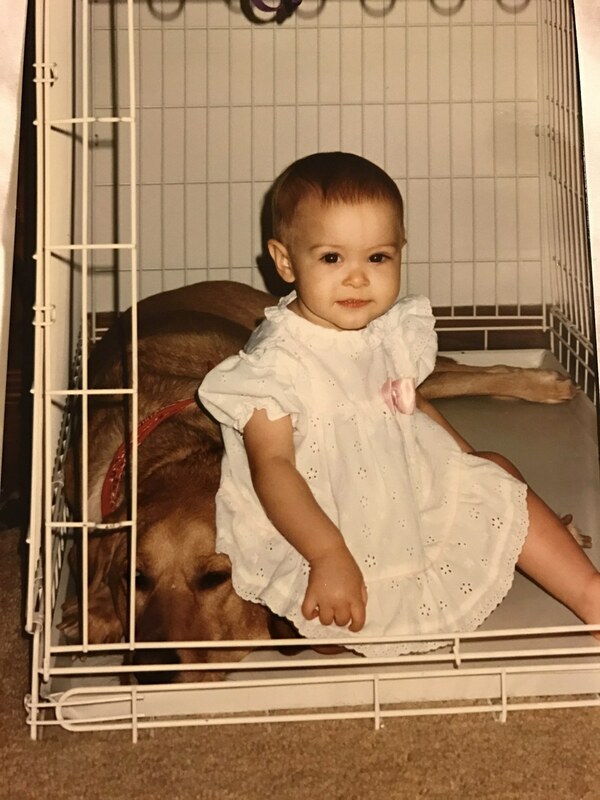 My earliest memory is sitting in my diaper on the kitchen floor, surrounded by Tupperware that I had pulled from the cabinets. Daisy, my ever watchful companion, did not alert Mom, but kept a look out for trouble. Or maybe my earliest memory is sitting on the couch, Daisy curled beside me. 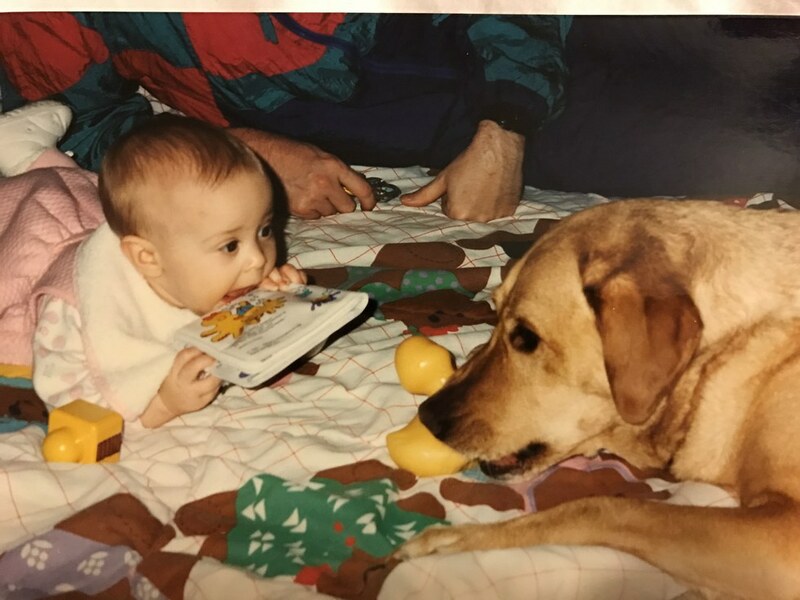 I remember watching her as she yawned and sticking my tiny, round fingers in her mouth to catch her slobbery, pink tongue. She blinked at me and gently pulled back before shutting her mouth, so her sharp canines didn’t catch my hand. Her ears were especially fun to play with. They were incredibly soft, like smooth silk. But if I ever grabbed too eagerly, she never nipped at me. Even when I occasionally tried to ride her like a horse, she gently walked about, careful not to toss me off. As I got older, Daisy and I developed a habit of tea parties on the living room floor. Daisy was getting older too, but as her energy waned, her patience did not. I would lure her from her favorite sunny spot near the back door with a stash of stolen doggie treats. I knew the way to her heart was with food. Like me. We were sisters, after all. She would lay on my spread out table cloth, often times covering up the cups and platters I had sat out for our imaginary feast. Most of the time she would settle into a snooze once she realized my bait had been used up. But some days, especially when we were both still young and spry, she would let me dress her up. One day I sat on the floor of my bedroom and struggled to put one of my old t-shirts on her. She calmly let me lift her paws and shove her skinny legs into the arm holes. We struggled for a while with getting it over her wide head and silky ears. Once the shirt was on, it was clear that it was too tight for her broad dog chest, but she didn’t seem to mind. Instead, she just calmly went in search of my mom or someone else competent enough to release her from her new straightjacket. Her strong whip of a tail whacked my door frame in farewell as she left. Daisy may have had seemingly unending patience, but she still needed her alone time. Whenever she was nervous or just overwhelmingly tired, she would retreat to her crate. That was her sanctuary, a place to hide away from the crazy toddler terror. Or at least, that is probably what she intended for it to be. But if I ever discovered her there, I would promptly crawl in beside her. We both liked enclosed spaces (though I grew out of that), and I would regularly create a blanket fort for us in the living room. She was too large to squeeze in with me, but her head or a paw often poked its way inside. Sometimes, she would simply lay on the sunny side of the fort, her shadow pressed up against the sheets. Her gentle presence was always there, keeping careful watch over her mischievous charge. I wasn’t the only one that could be mischievous, though. Daisy was a saint, but she had a hidden naughty streak. Her fondness for food often led her to steal pies and other delicious treats whenever her long snout could reach. She would eat anything—except lettuce without dressing. That was asking too much of her. The toothpaste tube, cap included, could be easily downed and pooped out a few days later, but lettuce without dressing appalled her (as it should anyone). And, though she kept a close watch on me, Daisy liked to sneak away from the house in search of tasty treats the neighbors might have tossed. She would sit in the front yard, sunning herself and serenely sniffing the air for any good finds. Slowly, when our backs were turned, she would inch her way closer and closer to the edge of our property. She always did it so discretely; it was impossible to notice she was even moving further away. Then, in a flash, she’d vanish between one blink and the next. Often times, it would take hours to find her, usually happily chomping down on some tasty piece of trash she’d found three houses down. Despite all the scolding she would inevitably get, she never gave up the habit until her joints became too painful for her to move very far from the house. Sometimes, especially as I got old enough to notice differences between my appearance and the appearance of the rest of my family, I wondered if I was actually related to Daisy, instead of my parents. I was golden haired and brown eyed, just like her. My parents, however, had thick dark hair. My brother and my dad both had blue eyes, another noticeable difference. Naturally, my four-year-old brain wondered if maybe I’d been adopted from wherever Daisy came from. Of course, just to clarify, I was wrong—I do actually look a considerable amount like the rest of my family now. But when your dog is the sibling you most resemble, you do start to wonder. Daisy passed away at the old age of sixteen. She lived a full life, though much of her older years were spent guarding my antics. 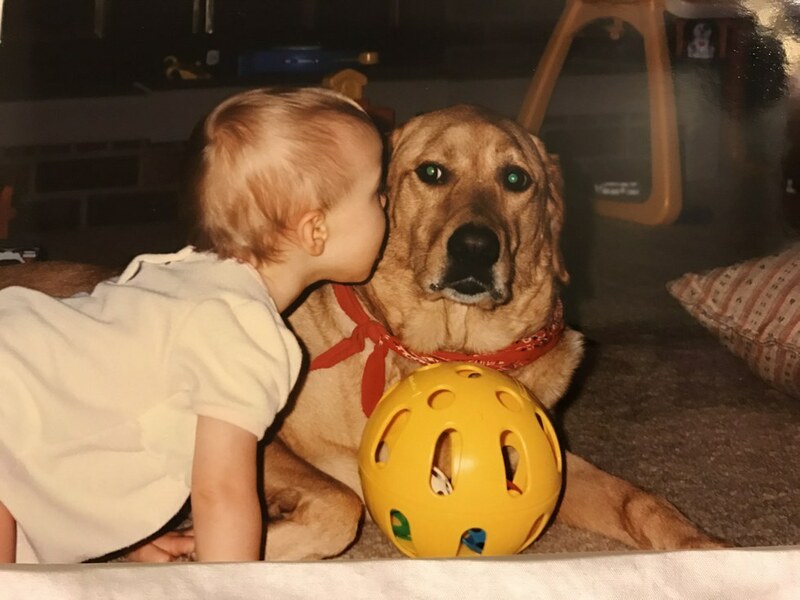 She may have been a dog, but she was my sister and guardian, my loving caretaker. 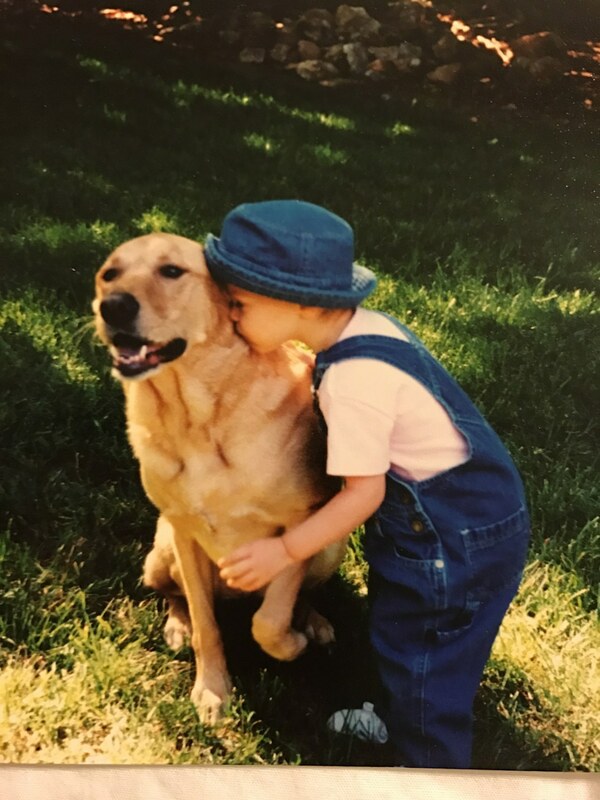 Her sweet, mischievous spirit created so many of my childhood memories, and she was my first best friend. I don’t know if she understood me when I told her “I love you” as I held her frail and gray paw those last few moments we had together. I don’t know if she even still had all those memories I will keep forever. 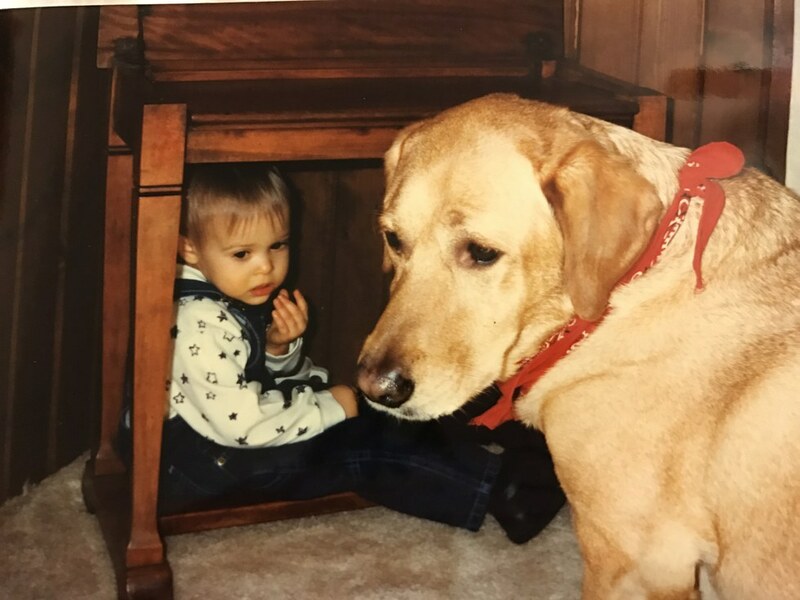 But I know that she loved me, and for that, I will always be grateful to a patient, sweet Labrador named Daisy.